Henri Nouen explores similar themes of discovery in his book Life of the Beloved– a journey of knowing ourselves loved in every cell of our being. Becoming the Beloved. My own particular journey of becoming has in recent years, been that of a journey towards priesthood. One week today, I will go into a time of retreat and guided reflection in preparation for being ordained as a priest on Saturday 29th June. In Rounding the Last Bend, and Stepping Stones, I reflected this time last year, on the final stages of ordination training and the journey towards being ordained deacon. One year on, and I now approach the moment of becoming who I believe God is calling me to be. Becoming who he has been fashioning me into over the course of my life time. Although it feels like there will be a deep sense of completion, it is not a question of arriving. I am still on this ‘grand adventure of becoming’ that is God’s constant invitation to me. The picture of the chalice being shaped, is the front of my ember card. 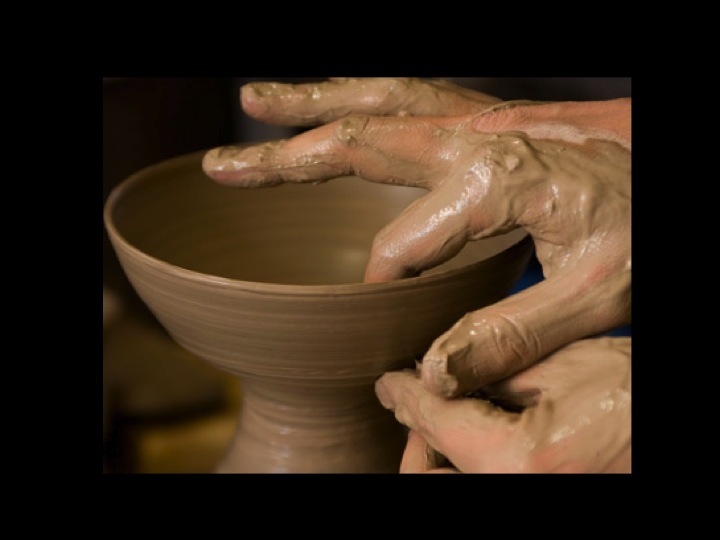 I chose it because it sang to me of the need to be pliable in the hands of the creative Potter who is fashioning me. To let him use all the circumstances of my life, past and present to form me as he sees fit. This particular lump of clay has wrestled and fought those hands, vigorously resisting this call to priesthood. (You can read more on this struggle in Where is your Home?) Yet all along he has simply been calling me to be me. Shaping me into who I am. Borrowing an alternative analogy I used in an earlier post, Born to Fly and related to the name of this blog, I was born to fly as a feather on God’s breath. No more. No less. I started with a quote from ee cummings, a particularly favourite poet of mine. I’ll close with another..
May I be I . Amen and amen. May I have courage, grace, openness and trust to become. To go on being and becoming. If you can add your prayers to mine for this significant moment of transition, it would mean a great deal to me and you have my heartfelt thanks. This entry was posted in Uncategorized and tagged adventure, becoming, being, courage, ember card, God, grace, invitation, ordination, Pottter's hands, Priest, Religion and Spirituality by afeatheronthebreathofgod. Bookmark the permalink. May we all have the courage, grace, openness and trust to become, to go on being and becoming. And may God bless you richly as you pursue this journey toward the priesthood. Thanks so much for this, David (may I call you that?) I hope you didn’t mind me quoting you? I am savouring your book. When this blog post was in gestation, and I thought about writing about human becomings, I searched the net to see if anyone else had used the phrase and how… And found a timely gift. Thank you. Please do call me David. I am honoured by your use of quotes from my books and so glad you are finding them soul nourishing and spirit enabling. I certainly am, and those are the most apt words. One of the special books that fall “God-incidentally’ into my hands at just the right moment. A lasting treasure I can warmly recommend to others. Thanks, David. I have ‘liked’ you on fb, so should get the posts in my news feed.